Last Saturday, delegates to the California Democrats Convention from Region 5 (encompassing most of Alameda County, as well as western Contra Costa and northeastern Santa Clara counties) had a pre-convention meeting. At the meeting, I introduced a resolution to have the California Democratic Party urge Congress and the California Legislature to pass legislation requiring police to obtain a warrant before using drones for law enforcement purposes. The resolution (see below for the text) was overwhelmingly approved by the delegates present at the meeting. It now goes up to the state party’s Resolutions Committee for consideration – along with potentially hundreds of other resolutions passed by county committees, charted organizations and regional meetings or signed by multiple delegates throughout California. The Resolutions Committee will bring a handful of the resolutions submitted to the floor at the Democratic Convention in April, where delegates to the Convention will vote on them (often by a voice vote, which gives those with louder, deeper voices and advantage!). But if it passes, it will be a clear message to Democrats both in Sacramento and in Washington that people are concerned about the invasion of privacy that drones represent. If the Resolutions Committee doesn’t bring this resolution to the floor, then we will need the signatures of 300 delegates present in Sacramento to bring it to the floor ourselves. If you will be a delegate to the convention and want this resolution passed, please contact me so that I can get your signature if need be. Please let other delegates to the convention know about this resolution as well! 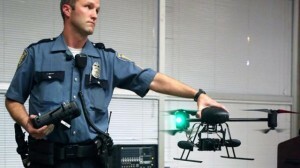 Restricting the use of drones in law enforcement has become a particularly urgent matter for residents of Alameda County, as the county Sheriff is planning to acquire them and does not accept any privacy restrictions as to how to utilize them. Absent a state law, law enforcement could use drones to monitor demonstrations, peek into people’s windows or take infrared pictures of homes through walls – among even more nefarious things. Sadly, it’s been the libertarian branch of the Republican Party that has been most concerned about the unconstitutional use of drones. But Democratic leaders are starting to see the dangers of this technology. Earlier this year, Congresswoman Zoe Lofgren (D-Silicon Valley) introduced legislation that would require warrants for the use of drones in law enforcement while state Senator Alex Padilla (D-San Fernando Valley) introduced a spot bill to provide some state regulation on the use of drones. Unfortunately, not all efforts to regulate drones are in good faith. In Arizona, Republican lawmakers introduced legislation to both promote Arizona as a test-ground for drones and to require police to get warrants before using the drones, but almost immediately gutted the privacy aspects of the bill. Assembly members Jeff Gorell (R-Thousand Oaks) and Steven Bradford (D-Los Angeles) may have a similar plan for California. They’ve co-sponsored one bill that would provide financial incentives to drone-building companies locate in California and another that would place privacy limits in the use of drones both by public and private actors. Both assemblymembers have taken contributions from drone manufacturers and Gorell is a former District Attorney and Navy Intelligence officer, so it seems unlikely they are actually concerned about the misuse of drones. NOW, THEREFORE, BE IT RESOLVED, that the California Democratic Party calls on the United States Congress and the Legislature of California to adopt legislation restricting the use of drones for law enforcement purposes without a warrant. CA previous version of this posting featured the resolution I originally proposed, before it was amended and voted upon by Region 5. This has now been corrected to show the resolution that was passed by Region 5 and submitted to the State Convention. I apologize for the error. Margarita Lacabe, the author of San Leandro Talk, is a human rights activist, a member of the Alameda County Democratic Central Committee and a delegate to the California Democrats Convention. My thanks to you and your fellow delegates for the hard work of defending our rights. Now that we know Obama’s Assassination policy, it seems privacy is the least of our concerns. Homeland Security’s weapons purchases forewarn of dangerous times ahead. America cannot be allowed to mutate into the Fourth Reich, and the world cannot become America’s “colonies”. Thank you again for having the foresight to act even before Goverment’s intentions were known. I’m writing from the point of view of a Democrat. It’s sad for me that my party has given up on its responsibility to stand up for human rights. I am happy that this is an issue that others have taken on, but shame on us Democrats for not.